Comfortable Crescent cushions while performing yoga. These crescent cushions are designed to provide support to thighs and easing pressure on knees and hips while doing Yoga. 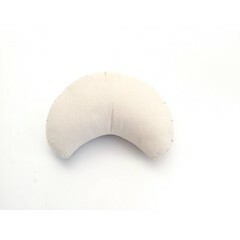 These crescent cushions are made from different fabrics and filled with natural buckwheat hulls or spelt. These cushions are also called ‘heart cushions’ as when one sits, the heart region opens up on its own with all the grace and ease. Crescent cushions are very light in weight and comfortable to use.